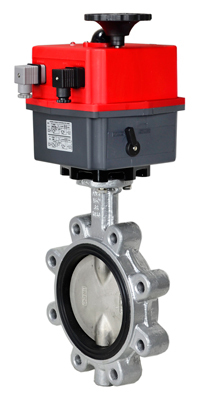 Electric actuated soft seated butterfly valve for on-off control of hydrocarbons, oil and other media compatible with the materials of construction. Lug style valve sandwich mounts between standard ANSI / ASME Class 125 / 150 flanges. Standard unit is power-to-open and power to close, stays in last known position with loss of power. On receipt of a continuous voltage signal, the motor runs and via a flat gear system rotates the disc. The motor is automatically stopped by internal cams striking micro switches at both open and closed positions. On receipt of a reversing continuous signal, the motor turns in the opposite direction reversing the valve position. Direct Mount Butterfly Valve Lug FPM 6"